LOS ANGELES — Consumers aren't apparently waiting until the fall to buy shiny, new iPhones. 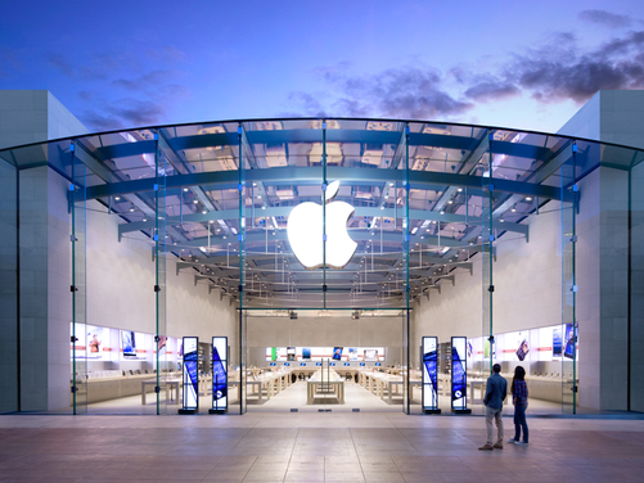 Apple had a good fiscal third-quarter on Tuesday with sales and earnings that exceeded Wall Street's expectations. Apple announced revenue of $45.4 billion and earnings of $1.67 per share, compared to the year-ago quarter of $42.4 billion and $1.42, respectively. Analysts had expected revenue of $44.9 billion and earnings of $1.57 for the quarter. The results sent Apple shares up 6% to a record $159.22 in after-hours trading Tuesday. At $775.5 billion, it is within striking distance of becoming the first company to be valued at $1 trillion. The June quarter is historically Apple's slowest. As in most years, sales of the iPhone taper off in the spring and summer, as folks await a new model that debuts each fall. The next iPhone, reportedly sporting a major redesign and packed with new features such as facial recognition, is expected to be introduced in September. Still, during its third quarter, Apple sold 41 million iPhones and 11.4 million iPads, compared to 40 million iPhones and 9.9 million iPads in the year ago quarter. The bump is impressive for the iPad, which had been seeing declining sales for the past two years. Apple also racked up $7.3 billion in its Services division that includes iTunes, Apple Music and the App Store, up 22%. In the year-ago quarter, Apple generated $5.9 billion in Services, so that's a huge jump for movie rentals, music subscriptions and app downloads. The Cupertino, Calif., company is now sitting on a pile of $261 billion in cash. While the sale in this quarter of 41 million iPhones pales compared to the fall quarter's 78 million, it's all a sense of perception. For chief rival, a "really good quarter," is when it sells 10 million of its Galaxy phones," notes Gene Munster an investor and analyst with Minneapolis-based Loup Ventures. "Nobody else comes near Apple's numbers," he says. "But Apple is held to a different standard." On a conference call with investors, Apple CEO Tim Cook called the quarterly results "very strong" and noted that some 1.2 billion iPhones have now been sold since first being released in 2007. Cook punted on a question about President Donald Trump's recent statement that Apple would build three new manufacturing plants in the United States. He noted Apple added 2 million jobs to the economy, mainly through freelance app developers, and invests in manufacturing parts like glass for iPhone and iPad from U.S. suppliers. "There are some things we'll say about that later in the year," Cook said. Munster predicts Apple will sell 236 million iPhones in its next fiscal year because of pent-up demand in the upgrade cycle, and excitement over Phone 8.